In preparation for a recent board of directors meeting, I was asked to review the Principles for Good Governance and Ethical Practice: A Guide for Charities and Foundations. In the spirit of New Year's Resolutions and a fresh start to making 2011 the best year yet, I'll share the brief description below and link to the guide. Happy reading, and even happier success in governance for the nonprofit you support! 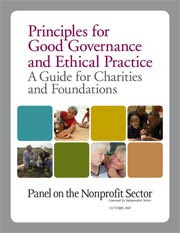 Principles for Good Governance and Ethical Practice: A Guide for Charities and Foundations was released by the Panel on the Nonprofit Sector in October 2007. The Guide outlines 33 practices designed to support board members and staff leaders of every charitable organization as they work to improve their own operations. The Panel encourages these leaders to examine the Principles carefully and determine how best they should be applied to their own operations. The development of these Principles included comprehensive analysis of over 50 systems of self-regulation and best practices, two public comment periods, and the involvement of charities and foundations nationwide. The Panel on the Nonprofit Sector has been dedicated to finding ways to strengthen governance, transparency, and ethical standards within the charitable community since its creation in October 2004 at the encouragement of the U.S. Senate Finance Committee.